It can get really hot under the bright lights in a TV studio. There’s little room for those who tend to buckle under pressure or who can’t smile reassuringly while they explain that 5,000 more people starved in Africa refugee camps. And it’s a personality driven business. While writers retain some anonymity behind bylines, news anchors become familiar faces, especially in mid-sized markets like Spokane. So Brown’s disappearance from KXLY’s evening lineup, where he’d been a staple at 5:00, 6:00 11:00 for nine years, didn’t go unnoticed. Brown’s contract ran until June of next year, but this fall a back injury put him partly out of commission, his mother-in-law passed away – and then he was arrested on allegations of driving drunk. He pleaded guilty Oct. 15 in Spokane County District Court to a reduced charge of first-degree negligent driving as part of a plea bargain with prosecutors. “That was a serious lapse of judgment on my part,” Brown says of the criminal charge, adding that KXLY management was aware he had been pulled over. The TV station, however, declined to discuss specific reasons behind Brown’s departure. Once Brown was off the air, rumors took off like wildfires in dry grass. “On TVspy (a blog) postings were very specific about where I had met with people and when and what we’d talked about,” Brown says. Most rumors had him heading up the South Hill to KREM-TV. “It was all fiction. 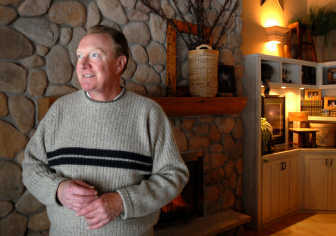 I hadn’t talked to anyone at KREM and I still haven’t,” he says, shaking his head in disbelief. He says he regrets not handling his departure better. Brown, 55, has been on the air for 32 years in such places as Edmonton, Alberta (his first TV job), Atlanta, New York and San Francisco. Susanna Baylon, who co-anchored three evening news shows with Brown for two years at KXLY, says he was one of the reasons she came to Spokane. She left KXLY in April 2006 to start a family. Being co-anchors is a little like being married, Baylon adds. Brown and his wife, June, have one daughter who lives in Queens, New York. He’s from Prince Albert, Saskatchewan, where he still has family. “We try to go back every summer,” Brown says. In 2003, the couple bought a home that came with countless improvement projects. “It’s a ‘60s rancher and when we saw it, it had yellow vinyl siding, and I looked at June and said, ‘You are crazy,’ ” Brown says. Now the rancher has what he calls a Montana lodge-style exterior. Brown is on the board for Cancer Patient Care, and he also volunteers for the Chase Youth Awards. Brown’s broadcast career took him, among many other places, to Beirut in ‘84, Mozambique in ‘90 and Zaire in ‘94, where he was within close range of the bombing of Goma airport. June, he says, has been an enormous support. “She’s put up with a lot in this business. She’s always allowed me to take a stab at things.” They’ve been together 32 years. Brown was at one time an English and history teacher, then moved onto a job as a speech writer for the Canadian liberal party in 1975. “We lost the election and all of us got fired,” says Brown, but a friend asked him to join the staff at CFRN-TV in Edmonton. That’s how he got started in television. Brown came to Spokane and KXLY nine years ago from KGO-TV in San Francisco. So is he thinking of retiring now?